My approach to grooming has typically been “minimalist”…actually, borderline “survivalist.” Just need to be clean. Don’t want to smell bad, but never really cared if I smelled “good.” And by “good” I mean fragrant or all cologne-y and stuff. It also meant I could just buy the cheapest shampoo and soap possible. Well the no-name junk seems to irritate my sensitive skin. How can that sound any less manly? And, I don’t like stuff on my person. My skin, or body or whatever. Jewelry, watches—but even worse—creams and sprays and the residue that all these body washes leave on you. My wife bought me the Dove Men+Care deodorant as the cheap stuff was making me all itchy and irritated. It was really awesome, and I didn’t feel like there was a chemical spill in my armpit. And they have a “+” in the name. That makes it all technical and scientific and stuff. Which is man-ly. And why I initially accepted it. But I wasn’t ready to give up my bar of soap. Some deodorant, body and face wash, bar soap and a scrubber thing. Also, more information than any man could ever know about skin care, courtesy of Dr. Jeffrey Benabio (@DermDoc)—Dove’s resident skin pro. It was also the first time a doctor took the time to answer questions in detail—even if I didn’t ask. I learned that lots of guys have problems with deodorant and that you should switch to a non-irritating or hypoallergenic brand. Sniff sniff. I’m not alone. Also, the reason I could be all itchy and stuff is that generic bar soaps are too harsh and strip the skin’s essential oils, drying out the skin. And the more you use them, the dryer you get. So, I tried the body and face wash. It wasn’t too perfume-y and I didn’t have that feeling that I needed to shower again using soap to get the residue off. And, @DermDoc says Dove Men+Care Clean Comfort Body and Face wash is a pH neutral formula and can help fight eczema, winter dermatitis and other skin irritations. Plus the package said it was “Sensitive Clean”. And we all now know…I’m sensitive. 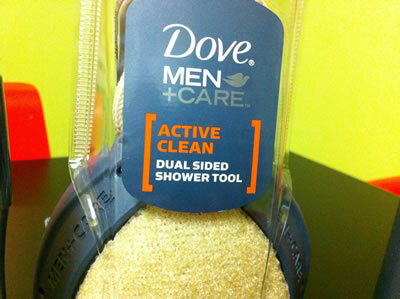 But the cool part was the Dove copywriter called the scrubby thing (like my wife typically uses), a “shower tool”. That makes it an acceptable substitute for a washcloth. And a required replacement for a loofah. Dual Sided Shower Tool. Insert "tool" in shower joke here. Nah. It was awesome, and has a rope so you don't drop it. In fact, one side of it is like a washcloth while the other has the scrubby mesh stuff. Dove also loaded me up on my already-favorite stick de-od, and a couple of their Body and Face Bars—I haven’t used them yet ‘cause I’m stuck on the body wash right now. Well, the cool thing is Dove Men+Care realizes I don’t want to spend a lot of time with some grooming routine, so they boiled it down to the essentials—skin survival if you will. And they included all the skin-helping moisturizers and other stuff I don’t want to have to think about. As an ad guy, I’ve been a fan of Dove since their “Real Beauty” campaign, and now I’m a fan because of their products, not just some risk-taking advertising. 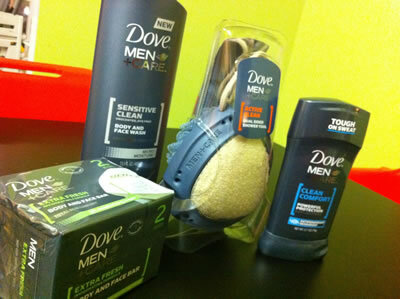 Learn more about Dove Men+Care by visiting www.dovemencare.com or www.facebook.com/dovemencare and if you have any dermal conundrums ask @DoveMenCare or @DermDoc on twitter. Disclosure: Dadand received some products pro bono for this review, but it doesn’t mean we’re not in brand love cause it’s a product we believe in. Second Disclosure: FYI I’m okay with pomade. Just look at that big hair in the photo on the top of this page.